Jonathan Davenport (49) slides ahead of Brian Shirley to take command. What won the race: Reigning Lucas Oil Series champ Jonathan Davenport of Blairsville, Ga., went by fast qualifier Brian Shirley on the backstretch of the 12th lap and won a wild second-half battle with Brandon Sheppard and others to capture the third round of East Bay's 43rd annual Wrisco Winternationals. Key notes: One of the longest-running Georgia-Florida Speedweeks tracks, East Bay hosts six straight nights of Lucas Oil Late Model Dirt Series action during the 43rd annual Wrisco Winternationals. ... Hall of Famer Billy Moyer is the all-time winningest East Bay Speedweeks driver; he's driving a Tye Twarog-owned car in his first East Bay appearance since 2015. ... The third-mile oval's surface famously changes throughout the night with tides from the nearby Gulf of Mexico thought to affect conditions. On the move: Josh Richards of Shinnston, W.Va., started 23rd and finished third. Winner's sponsors: Davenport's Lance Landers-owned Longhorn Chassis is powered by Cornett Racing Engine and sponsored by Nutrien Ag Solutions, ASC Warranty, Spartan Mowers, Mark Martin Automotive, Valvoline, Mega Plumbing of the Carolinas and Midwest Sheet Metal. Points chase: After two series points races, Earl Pearson Jr. has 490 points to lead Jonathan Davenport (460) and Tyler Erb (460); East Bay's Monday-Thursday events are non-points events. GIBSONTON, Fla. (Feb. 6) — After a couple of off-nights at East Bay Raceway Park, reigning Lucas Oil Late Model Dirt Series champion Jonathan Davenport of Blairsville, Ga., got back on track Wednesday with a $7,000 victory at East Bay Raceway Park’s 43rd annual Wrisco Winternationals. The fifth-starting Davenport, who had finishes of eighth and 11th the first two nights, zipped underneath fast qualifier Brian Shirley on the backstretch to lead the 12th lap, then came out on top of a battle royale up front in the second half of the race. Winning his fifth career Winternationals race, Davenport ended the two-race East Bay winning streak of Tyler Erb of New Waverly, Texas, who started eighth and raced to a second-place finish on the slick third-mile oval. Provisional starter Josh Richards of Shinnston, W.Va. — who intended to retire after a few laps — rallied from 23rd to finish third while 18th-starting Brandon Overton of Evans, Ga., and Brandon Sheppard of New Berlin, Ill., rounded out the top five. Sheppard appeared to have the best chance to outrun Davenport, taking the lead on the 24th lap and leading two circuits before he was bottled up on a restart, allowing Davenport to sneak back ahead on lap 26. When Davenport briefly lost momentum heading into turn three a few laps later, Sheppard nearly regained the lead, but J.D. beat Sheppard back to the line and paced the rest of the way. “Every driver out here earned their paycheck tonight,” said Davenport, who used an unorthodox wide-slung restart to get rolling again after cautions. “That’s the slickest place in the world down in (turns) one and two. You’ve gotta just putt around the bottom, and you go around (turns) three and four and put it on the floor. Surprising polesitter Colton Flinner of Allison Park, Pa., led the first eight laps before Shirley, of Chatham, Ill., took over for three laps. When Davenport went ahead on the 13th lap he looked strong, but a series of mid-race cautions and wild restarts allowed lots of challengers in a 40-lapper where seven drivers held positions in the top three. Erb held the second spot the final 12 laps, but couldn’t find a way past Davenport. Finishing second in his heat race — which forced him to start on the fourth row of the feature — was too much to overcome, he said. “We had to race through the pack there and it was wild,” said Erb, the new Best Performance Motorsports driver who has three victories in five Lucas Oil starts in 2019. "Them restarts, when the leader would swing out, I was on the outside every time, but I didn’t want to be there because the guys on the inside would kind of run you up into ‘em. We’d meet in the middle, you know? In what he called a “crazy race,” Erb wasn’t too disappointed about a runner-up finish. Richards was surprised to end up on the podium of what he called a “long night” with his Clint Bowyer Racing team trying to diagnose a problem. “The motor hasn’t been running right,” Richards said. “We’ve had some fuel problems the last two days, and I told ‘em last night that something wasn’t right. So we made a change there right before the feature. “I was going to just ride around a couple of laps. Well, it felt like it was running (better), so then I just kept going. The next thing I know we had a shot to lead there. We didn’t really have a lot of time to work on the car, but I was just out there having run and chasing the racetrack. I’m just glad to be up front and in contention." Flinner, a former Lucas Oil Rookie of the Year starting on the pole of a national touring event for the first time, led the first eight laps but faded out of the top 10, slowed for a lap-25 caution and ended up 19th. Besides the caution for Flinner, the race was slowed by three cautions on consecutive mid-race laps (20-22) and three others for slowing cars (lap 27 for Billy Moyer Jr.; lap 30 for Ryan King; and lap 37 for Colton Horner). The first of the mid-race cautions appeared when Earl Pearson Jr. and Stormy Scott tangled in turn two (lap 20); on the next lap when Tanner English spun into the infield at the end of the frontstretch (lap 21); and finally when seventh-running Jimmy Owens spun in turn one, collecting Mike Benedum with a hard impact (lap 22). Action continues Thursday at East Bay with another $7,000-to-win event on the Lucas Oil Series. It’s the last non-points race of the week as the tour moves into points action on Friday and Saturday. Notes: Davenport scored his 36th career Lucas Oil victory and 13th of Georgia-Florida Speedweeks. … Nineteen drivers completed 40 laps. … Hudson O’Neal passed on a provisional starting spot because of engine problems; Devin Moran inherited that spot based on 2019 series points accrued by his team, Dunn Benson Motorsports. ... The feature ended at 9:18 p.m.
Row 6: Scott Bloomquist, Dennis Erb Jr.
Row 11: Colton Horner, Billy Moyer Jr.
Colton Flinner of Allison Park, Pa., was absolutely walking on air after backing up his group fast-time performance with a heat-race win that gave him the pole position for the 40-lap feature. The 2016 Lucas Oil Series Rookie of the Year who now drives cars fielded by John Johnson — the longtime car owner for his uncle John Flinner — will start from the No. 1 spot in a national tour feature for the first time. “I don’t care what happens still, this is surreal,” the 24-year-old Flinner said. “This is something I’ve dreamed about since I was a little kid — starting on the pole in a big race like this.” … Flinner was one of three heat winners who has never won a Winternationals feature, joining Brian Shirley and Tanner English. The other three heat victors — Don O’Neal, Jonathan Davenport and Brandon Sheppard — own a combined 21 Winternationals triumphs (led by O’Neal’s 14). … Tyler Erb will start eighth as he bids to reman perfect in this year’s Winternationals. He has an opportunity to become the third driver to win three consecutive features during East Bay’s annual February meet and the first to capture the first three features of the week since it was expanded to six events in 2000. … Jason Jameson scratched from the evening’s action after experiencing terminal engine trouble during time trials. His Rattliff Racing crew is changing motors to continue their racing week. … Hudson O’Neal retired from the first B-main with motor problems. He was in line for a provisional starting spot in the feature but passed on hastily pulling out his backup car to accept the position; the provisional instead went to Devin Moran. … Rusty Schlenk didn’t log a qualifying lap because he twice failed to pass pre-race inspection due to a deck height infraction. Finish (winner transfers): Matt Cosner, Rusty Schlenk, Terry Casey, Joel Callahan, Freddie Carpenter, Michael Lake, Dan Stone, Blair Nothdurft, Joey Moriarty, Greg Oakes, Vic Hill, Shanon Buckingham, Devin Dixon. Scratched: Austin Hubbard, Allen Murray, Tyler Carpenter, Joe Denby, Jonathan Rowan, Hudson O'Neal, Kerry King, Justin Williams, Devin Gilpin, John Tweed, Geoffrey Carey, Austin Rettig. First consolation (top two transfer): Tim McCreadie, Colton Horner, Greg Oakes, Matt Cosner, Shanon Buckingham, Rusty Schlenk, Freddie Carpenter, Joey Moriarty, Allen Murray, Devin Dixon, Joe Denby, Hudson O'Neal, Justin Williams, John Tweed, Austin Rettig. Scratched: Josh Richards, Jason Jameson. Second consolation (top two transfer): Kyle Bronson, Billy Moyer Jr., Michael Lake, Austin Hubbard, Terry Casey, Devin Moran, Jeff Mathews, Joel Callahan, Dan Stone, Vic Hill, Tyler Carpenter, Blair Nothdurft, Jonathan Rowan, Kerry King, Devin Gilpin, Geoffrey Carey. Scratched: Tim Dohm. Tanner English took command from outside the front row at the outset and cruised to victory in a race where Brandon Overton and Billy Moyer Jr. had a tight battle for the final transfer spot. Polesitter Dennis Erb Jr. battled early with Jonathan Rowan, who was up to second early but fell back to fourth courtesy Moyer's lap-three slide job in turn four. Moyer lost the third spot to sixth-starting Brandon Overton on the fifth lap, regained it on lap eight, then lost it again as Overton made contact in going by heading into turn one on the ninth lap. Rowan ended up seventh. Officials called back the first start. Finish (top three transfer: Tanner English, Dennis Erb Jr., Brandon Overton, Billy Moyer Jr., Austin Hubbard, Devin Moran, Jonathan Rowan, Tyler Carpenter. Brandon Sheppard swung around polesitter Ryan King exiting turn two on the first lap and held off Jimmy Owens by 0.294 seconds for a 10-lap victory. The third-starting Owens took second from King on the fifth lap and held onto the spot while King got the final transfer spot. Finish (top three transfer): Brandon Sheppard, Jimmy Owens, Ryan King, Jeff Mathews, Terry Casey, Joel Callahan, Blair Nothdurft, Tim Dohm, Geoffrey Carey. Fast qualifier Brian Shirley outran red-hot Tyler Erb at the start and raced to a heat victory. Erb, Monday and Tuesday's winner, finished a solid second with Mike Benedum getting the third and final transfer spot as the top three were far ahead of the field. Fourth-starting Kyle Bronson got way too high on the first lap and never recovered, edging Michael Lake at the line for a distant fourth. Officials recalled the first start. Finish (top three transfer): Brian Shirley, Tyler Erb, Mike Benedum, Kyle Bronson, Michael Lake, Dan Stone, Vic Hill, Devin Gilpin, Kerry King. Jonathan Davenport won from the pole position while Scott Bloomquist rebounded from a couple of lackluster nights with a runner-up finish in the third heat. Stormy Scott got the third transfer spot over Josh Richards while Justin Williams slipped back to fifth after running second the first two laps in the caution-free heat. Finish (top three transfer): Jonathan Davenport, Scott Bloomquist, Stormy Scott, Josh Richards, Justin Williams, Allen Murray, Austin Rettig, Joe Denby. Don O'Neal got the jump from outside the front row and captured the 10-lap prelim. Polesitter Morgan Bagley finished second after nearly slipping by O'Neal on the third lap with Gregg Satterlee securing the third and final transfer spot. Greg Oakes was a distant fourth. Officials called back two starts. Finish (top three transfer): Don O'Neal, Morgan Bagley, Gregg Satterlee, Greg Oakes, Hudson O'Neal, Shanon Buckingham, Freddie Carpenter, Joey Moriarty, Rusty Schlenk. Polesitter Colton Flinner, a former Lucas Oil Rookie of the Year, slid in front of Earl Pearson Jr. in turn three on the first lap and held on for the victory, in part saved by John Tweed's spin. Pearson dogged Flinner most of the way but lost second to Billy Moyer on a lap-six restart with Pearson settling for third. Moyer recovered from a poor start — he slipped from third to fifth on the first lap — but regained the third position on the second lap. John Tweed's lap-six spin drew a yellow and reversed the running order after Pearson had briefly overtaken Flinner exiting turn two. Finish (top three transfer): Colton Flinner, Billy Moyer, Earl Pearson Jr., Colton Horner, Tim McCreadie, Matt Cosner, Devin Dixon, John Tweed. Scratched: Jason Jameson. Row 1: Colton Flinner, Earl Pearson Jr.
Brian Shirley of Chatham, Ill., set fast time at the 43rd annual Wrisco Winternationals for the second time in three nights at East Bay Raceway Park. Shirley tripped the clock at 14.273 seconds at the third-mile oval in Lucas Oil Late Model Dirt Series competition. Shirley will start on the pole of the fourth of six heats. Other heat races polesitters: Colton Flinner of Allison Park, Pa.; Morgan Bagley of Longview, Texas; Jonathan Davenport of Blairsville, Ga.; Dennis Erb Jr. of Carpentersville, Ill.; and unrelated Tyler Erb of New Waverly, Texas, who is running for his third straight Winternationals victory. On another gorgeous February day on Florida’s Gulf Coast — skies are sunny and the high temperature reached 80 — Night 3 of the Wrisco Industries Winternationals boast a 52-car field. … Three drivers — Chase Junghans of Manhattan, Kan., Blake Spencer of St. Augustine, Fla., and Chuck Hummer of Lyons, Ohio — departed the pit area to head north for the Feb. 8-9 World of Outlaws Morton Builders Late Model Series season opener at Screven Motor Speedway in Sylvania, Ga. … Also not competing Wednesday is Zack Dohm of Cross Lanes, W.Va., whose struggles prompted him to take at least one evening off and focus on his father Tim’s effort. “I’m all out of ideas,” Zack joked. “I’m not spending any more money until I get some good ideas. We’ll see what we can learn with (Tim’s) car tonight.” … Chad Stapleton of Edinburgh, Ind., has his car unloaded in the pit area but won’t race until Thursday night. He just took delivery of an open-competition engine he is installing in his machine. … Ryan King of Seymour, Tenn., and his Warrior house car team have pulled out their newest machine, which was debuted in the weekend’s doubleheader at Golden Isles Speedway near Brunswick, Ga., for Wednesday’s action in an effort to shake their struggles. … First-time East Bay entrant Justin Williams of Shipman, Va., who appeared headed to a runner-up finish in his Tuesday heat until a late caution flag tightened the field and he dropped from a transfer spot (he ultimately didn’t qualify in a B-main as well), has a Winternationals-proven engine under the hood of his car. He’s using the same powerplant that Brandon Overton of Evans, Ga., borrowed from Williams’s uncle, veteran engine builder Randy Clary, to win a feature last year at East Bay. Clary, who is in the pit area assisting his nephew, said he told Williams to utilize his motor for the week and save a new engine he’s built for him. … Tye Twarog of Coschocton, Ohio, who is fielding a car for Billy Moyer of Batesville, Ark., in the first four nights of the Winternationals, said his former full-time (and now part-time) driver Devin Moran of Dresden, Ohio, paid him a visit in the pit area and made a tongue-in-cheek proposal. “He was joking around and asked if he could get my other car out to run because he’s struggling to get going (with his new Dunn Benson Motorsports cars),” said Twarog, whose second car — a machine Moran will drive next week at Volusia Speedway Park in Barberville, Fla. — is the same XR1 Rocket that Moran piloted to a Prairie Dirt Classic victory last year at Fairbury (Ill.) American Legion Speedway. … Bob Geiger of Laurel, Del., suggested at the start of the week that this might be the 39th and final Winternationals appearance as a driver, but the soon-to-be 67-year-old decided to step out of the cockpit after Tuesday’s action and put Geoffrey Carey of Georgetown, Del., behind the wheel for Wednesday’s program. Geiger does plan to continue racing this season in his home state. … Lucas Oil Series officials announced during the drivers’ meeting that they are taking up a collection for Tennessee native Richie Davis, a longtime crewman for Darrell Lanigan and Clint Bowyer Racing who is absent from Speedweeks because he’s battling cancer. 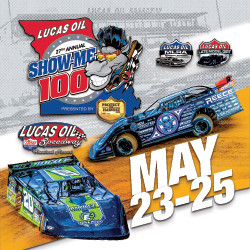 Donations can be made at the Lucas Oil operations trailer in the pit area. It’s Tyler Erb vs. the World at East Bay Raceway Park’s 43rd annual Wrisco Winternationals as the 22-year-old New Waverly, Texas, driver tries to become just the third driver in history to win three straight miniseries events. The red-hot Erb earned $5,000 apiece in Monday and Tuesday’s victories and has started the Lucas Oil Late Model Dirt Series season with three victories in his first four starts during Georgia -Florida Speedweeks. Erb heads into Wednesday’s $7,000-to-win program going for three in a row. Only Josh Richards (2009) and Billy Moyer (1985-’86) have won three straight Winternationals events. Richards and Moyer will be among drivers trying to halt Erb’s streak along with Brandon Sheppard, Earl Pearson Jr., Don O’Neal, Scott Bloomquist and Dennis Erb Jr., unrelated to the red-hot Texan. The expected field of 50 or so entries will be split in half for time trials followed by six heat races (three apiece transferring), two consolation races (two apiece transferring), the Berry Barn Strawberry Dash presented by DirtonDirt.com and the 40-lap main event. Row 11: Horner, Moyer Jr.